This week’s Mosaic Monday is brought to you by the Portland Japanese Garden – one of the most beautiful places in the city. 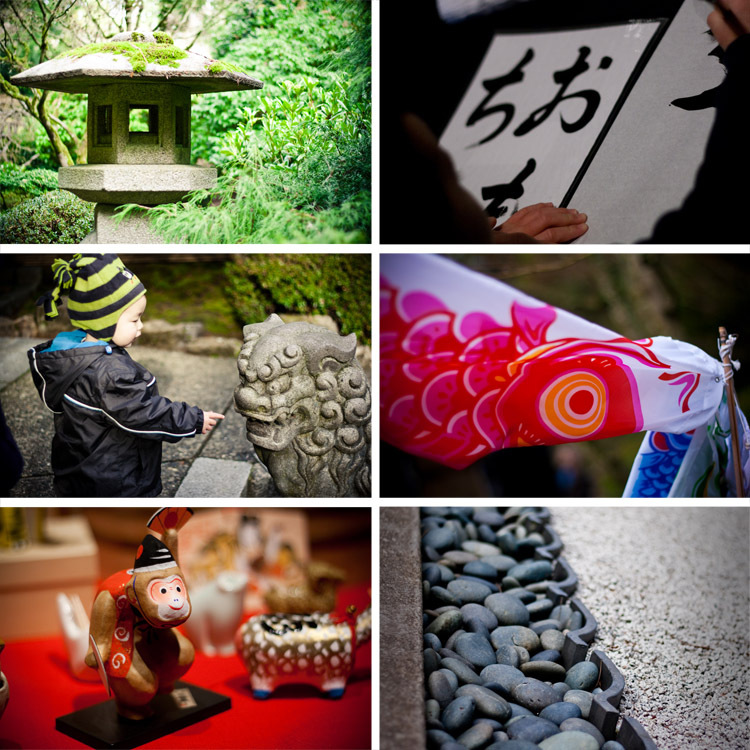 We took the opportunity to visit for a special Japanese New Year celebration on Sunday. They had calligraphy demonstrations, rice crackers and green tea. The highlight for Thomas was when he spotted Chika Sensei, the Japanese intern in his pre-school class. It was about the same reaction that I would have if I ran into Robbie Williams on the street, but without all the screaming and fainting. It was wonderful day to get out of the house and enjoy the gardens in winter. I really need to make an effort to go back for photo sessions during every season. The colours duiring spring and autumn would be just incredible – the photographer’s dream. This entry was posted in Challenges, Lyrebird Images, Photography, Thomas. Bookmark the permalink. Sounds like a fun day and you have some great colorful shots. I laughed when I read your sons reaction to his class intern almost like a Robin Williams reaction:) You made me laugh. Lovely! Wonderful images … but I am especially fond of little children with curious fingers, so that is my favorite. Great photos of a fun day!